God, the Father, who created heaven and earth; Jesus Christ, the Son, who died for our sins and redeemed us; and the Holy Spirit, who guides and teaches us personally and professionally, through God’s inspired Word, the Bible, our ultimate authority of faith and conduct and through the communion of Christians. These are described to help individuals study God’s word, discover personal guidance for their lives and implement the message of the Gospel to his or her professional practice or scholarship. 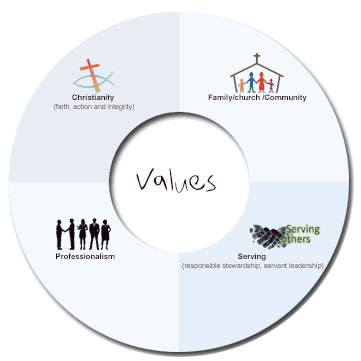 ACC values Family, Churches and Communities that are essential components of society. The contemporary society is increasingly diverse and complex and the forms of families have changed rapidly. In order to enhance the health of society, healthiness in families, churches and communities are needed. ACC believes that recovering families and churches through right Christian education is necessary with the restoration of communities. ACC values excellence which was demonstrated in the life of Jesus in the Bible. The demands of a fast moving global economy also require more well – skilled people who can keep pace. Therefore, ACC is committed to provide excellent Christian education to meet the current demand. ACC is committed to help individuals to be contributors to families, churches and communities. One of the reasons for personal restoration and professional training in ACC is to be a person who can serve the people. ACC equip individuals to have servant hood in their life, work place and to serve people with their practical skills and knowledge. Mail : PO Box 1264 Dickson ACT 2602, © 2014-2018 Australian College of Christianity - All rights reserved.